Stargate SG1 was a 60 minute sci-fi series on the Sci-Fi Channel about a top-secret military unit that explored the galaxy via alien devices called Stargates. The Stargates enabled them to do this by creating "wormholes" that connect one Stargate to another. They simply stepped into the Stargate on Earth, traveled nearly instantaneouly through the wormhole, and stepped out onto another world! SG1 and the other teams explored the planets of our galaxy, aided the people that they found there, and helped them maintain their freedom from the Goa'uld - a race of powerfull and evil aliens that pretended to be Gods. Later in the series new and even more powerful aliens continued to threaten Earth and her allies. Some of the other Stargate SG teams are: SG-3 & 5 (Marine Units), SG-7 (Science Unit), SG-8 (Medical Unit), SG-9 (Diplomatic Unit) and SG11 (Engineering Unit). 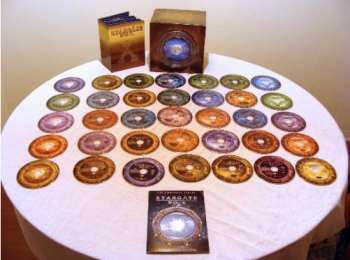 Stargate SG1 created a "spin-off" series called "Stargate Atlantis". That show's character, "Dr. Elizabeth Weir" appeared on the first two season 8 episodes of Stargate SG1 titled, "New Order - Parts 1 and 2". General Hammond's grandchildren got their names from a combination of series creator Brad Wright's daughter's names, "Tessa" and "Kayla". A combination of those names was also used on the series, "Stargate Atlantis" to come up with the character "Teyla". In "Children of the Gods" (1st Stargate episodes), Capt. Carter states that it took them 2 years to "MacGyver" a dialing system for the Stargate. "MacGyver" was the name of the 1985-1992 TV show starring Richard Dean Anderson. A Stargate is composed of the metal "Naquada". It is found nowhere on Earth but is available on several planets that can be reached through Earth's Stargate. "Naquada" is the only known element that absorbs Neutrinos (they just pass right on through all other elements). This absorbsion provides the energy to create the wormholes. Richard Dean Anderson dated German ice-skater "Katharina Witt" but he should have met her earlier in life. At age 16, he broke his left arm while ice-skating. Three weeks later he broke the right one. Christopher Judge played defensive safety on the football team at the University of Oregon. He was, in fact, a three-time "All American". He even played in the "Hula Bowl" during his senior year! If the first time you saw Stargate SG1 episode #20 "There But For The Grace Of God" you thought that it was a repeat, you probably were a "Doctor Who" TV show fan. One of that series' episodes (Inferno) where an "alternate" Earth, run by the military is being threatened with destruction by aliens (Pretty identical screenplays). Don S. Davis (General Hammond) worked previously with Richard Dean Anderson on his "McGyver" TV show. He was the "body double" for Dana Elcar. By the way, while Don was never a real life General, he was once a Captain in the Army. The Complete Series on 54 Dvds! Thank you for visiting our Stargate SG1 page!